Koh Russei is still living under the shadow of its former self, as a package tour and backpacker hangout with dirty beaches. But these days, the island has renewed itself after a major bulldozing by the Cambodian government eliminated all but one set of bungalows and a small cafe. At less than an hour from shore, Koh Russei, or Bamboo Island as it’s known, is the best island to visit if you’re pressed for time. The island is still popular with backpackers, but local expats and other visitors also find pleasure in the golden beaches and island barbecues. It’s worthwhile to stay overnight at long-running Koh Ru, which is on a quiet beach on the part of the island never visited by the tour boats. It offers simple beach bungalows and dormitory beds year-round. Accommodation to stay on Koh Russei reviewed by Travelfish. Koh Ta Kiev is the widely-ignored little brother of the island group. Koh Ta Kiev Resort has been in operation for a few years but many travellers have passed it by, perhaps due to the “resort” moniker (which for a collection of simple but sturdy bungalows is soundly undeserved). Recently new accommodation has taken up residence where Jonty’s Jungle Camp used to be. Ten103 Treehouse Bay is nestled deep in the jungle and offers delicious daily specials by professional chefs. 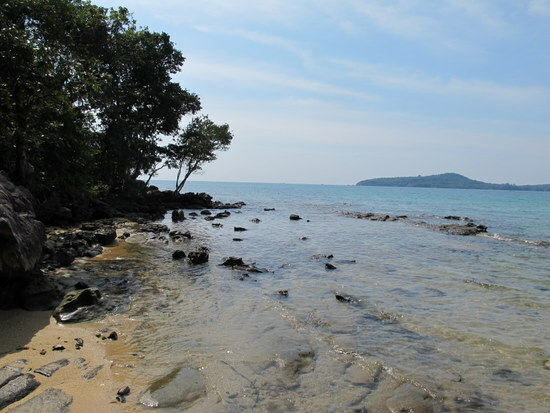 Koh Ta Kiev itself is beautiful, and is one of the closest to Sihanoukville’s mainland. It takes less than an hour to get to one of the three yellow sand beaches surrounded by pine trees &8212; from there, trek into the jungle where more than 100 species of birds make their home as well as some other interesting types of wildlife such as the carnivorous pitcher plant. Snorkellers will also get their fill, and can see giant mussels that aren’t found at all of the other islands. 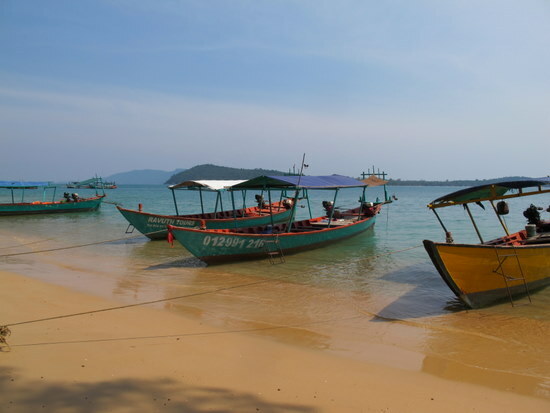 Koh Takiev is an huge island with numerous beautiful beaches where you will be totally alone. The two long, beautiful fine sand beaches, each a kilometre in length, look like two bows on each side of the rocky headland. Often golden eagles are spotted. These beaches are the pride of the island which also includes a charming additional beach with 360 m of amber sand. To the south of the centre of the island is a water body shaded by trees. In the 30-40 m peak hills are found hillside forests. The ‘open sea’ beach to the south-west (800 m) faces the sea to the sunset. The south-east beach (1 km) is called ‘ivory’ in reference to the colour of its sand. It faces the sunrise with a clear view of the sea. The eastern beach (360 m) is called ‘amber’. It is close to the jetty and the fishing village, overlooking the sea, the Phu Quoc (Vietnam) islands and Ream national park. Facing sunset, a green, gilt-edged crescent, resting on emerald or blue water: this is the island one always longed for, the archetype from your wildest dreams…Koh Russey. A jewel of a beach with fine pink or ochre sand and a deep and mysterious forest. For those loving the sun falling into the sea whilst surrounded by jungle sounds, Koh Russey is the place. An island of gentleness. Its virgin, private and intimate characteristics make it a site for high-end development, and positively compare with the world’s most exclusive sites. Please tell us which is your favorite spot in Cambodia. The most beautiful beach, the clearer sea, the one you love…. It was established in 1993 and encompasses 210 km² including 150 km² of terrestrial and 60 km² of marine habitats. The national park contains beautiful beaches, mangroveforests, tropical jungles and over 150 species of bird and is well noted for its monkey population. You are looking to build your professional building in France? For instance, you want to construct your own office or medical house? Don’t look any further, we have the solution for you. InterPro,subsidiray of babeau Seguin, french constructor is the right partner to help you build at the best cost anywhere in France. You should visit their website to see how it takes to build gorgeous professional building.